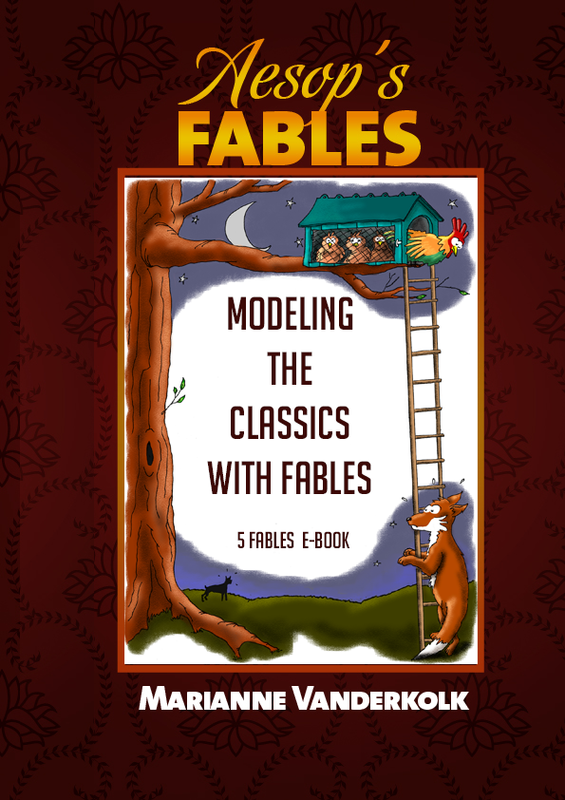 Fables are a great vehicle to create language arts lesson plans. Using one of Aesop's Fables, language arts can be taught in an integrated way - teaching handwriting, spelling, writing techniques, grammar and punctuation. This is done by selecting a Fable and drawing all the aspects of language arts from this - the grammar, spelling, handwriting through the simple techniques often attributed to Charlotte Mason. 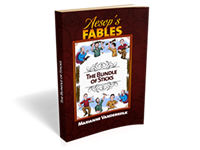 Using Aesops Fables and other literature you are using can be a way in which you create a complete homeschool language arts curriculum. What does it look like and how do you use Aesop's Fables as a base of a language arts lesson plan? That's what this page is about. Why create a language arts lesson plan with a Fable? A fable is a little story which imparts a moral lesson. It often includes animals, plants, forces of nature which take on a human qualities. It is a great starting point to help students see how a story unfolds in a cetain setting with a simple plot. Using this as a base, one can create a language arts lesson plan and help students to write a little story, with only a few characters, in a setting, facing a problem and coming to a conclusion as well as teaching a moral lesson. Firstly, enjoy the Fable. Read a number of Fables and talk about what they mean, how they are written, the moral at the end. In your discussion, ask your children how they might re-write the fable. What character would you use? What would they do? Does it teach the same moral lesson? Is there another way you could teach the moral lesson? Can you change the setting? How would you do that? Explain. Once you have enjoyed a number of fables, then choose some of them. Choose them for their literary devices (descriptions, characters, use of dialogue, use of metaphors, the moral of the fable). You may choose to emphasize this literary device in your discussions and as you teach writing techniques. Using a step by step detailed approach, you can turn any fable into a language arts lesson plan. 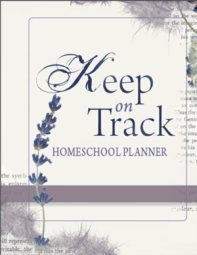 I am using the same Ten Day Outline which I used to describe how to create Homeschool Language Arts Lesson Plans based on Literature. Check out my latest set of Ebooks - Aesops Fables Copywork Ebooks which contain beautiful illustrations of different fables both in colour and black and white. These ebooks demonstrate how I use this process. If you're not too certain to design your own language arts lesson plan, buy the Aesop's Fable Copywork Ebook - and once you've worked through it, you will have confidence to try it out on any other fable or on other literature. It's a great way to incorporate language arts lessons into the context of your literature readings, history readings, poetry and use them all as a source of copywork. Copy the Aesop's Fable carefully. Use cursive or print. Decorate it if you wish. The Aesop's Fables I have chosen have printing and cursive handwriting worksheets which your child can trace over or write on to the illustrated copy of the fable. There are also handwriting printable pages which are lined for different aged children. The beauty of these Aesop Fables Copywork Sets are the illustrations. The fable is copied onto colour pages which have an illustrated border relating to the fable. There are also pages which are illustrated in black and white so your child can colour in. If you would like free handwriting printable worksheets used for different ages, see my free printable writing paper page. 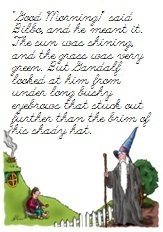 Choose spelling words from the copied Fable or the selection from the Fable. Discuss the words; Write them on a whiteboard or make a special Aesop's Fable Spelling book. List the spelling rules which the words follow and create a list of other words which also use the same rule. You can look for words which use the same beginning, middle or end phonogram. One excellent resource which I have found useful in teaching my children was ABC and all her Tricks. This has lists of words according to their phonemes. The Reading Teacher's Book of Lists is also an excellent resource. Discuss the grammar used in the passage. I have loved using Winston Grammar. This program uses cards to identify different parts of speech. You can do this on your own also. If you have covered some of the parts of speech, you can now identify them in the sentences and use different colouring pens, markers or highlighters to identify nouns, verbs, adjectives, adverbs and so on. My page on the parts of speech is a good place to start. It helps you to understand the parts of speech and learn the questions you need to ask to find them in a sentence. It will help with phrases also. Check out the parts of speech page for some extra help. You may also wish to diagram these sentences. Use the copywork from Day One as an exercise in dictation. Read the excerpt (or the whole Aesop's Fable) and ask your child to write it. On Day One, you should have taken time to look at the way dialogue was written or the correct use of capitalization etc. This work done on Day One - is preparation for this dictation exercise. If you find your child needs more time, why not work on the passage over a few days? Look at it again, copy out parts of it, and then dictate again. Now, this is the fun part! Firstly, remove all the flowery, descriptive parts out of the passage so you are left with the barebones of the passage. One things I get my children to learn early on is a list of prepostions. We sing a preposition song to the tune of Yankee Doodle. Once you have found a preposition, all you need to do is to find the noun that goes with the preposition and you have found the prepositional phrase. It is helpful to do this because you will find that by removing the prepositional phrases in the passage, your sentence will have diminished substantially. Then find any adjectives (describing words) in front of the nouns and adverbs. Scan the sentence and try to find the barebones of the sentence. What is the smallest possible combination of words which still makes sense? Even if you have just a noun and a verb, you still have a sentence. By removing the flowery, descriptions you will get to the essential elements in the story. Write an outline of the plot or description. Use only a few keywords to capture the main points. Now, it is time to put words back into the sentence and build upon the bare bone outline. Use a thesaurus to find interesting verbs, dual verbs, nouns, pronouns, adjectives, adverbs. Create a paragraph which is descriptive and interesting. You can either choose to stay as close to the original as possible, or choose to make your own creative work - using your own characters etc. Review the writing from Day Six and focus on improving the style by using different sentence openers, using prepositional phrases, using adverbial and adjectival clauses, using metaphors and similes. You may add dialogue. Check out this page on how to teach Writing Stylistic Elements. - Here I discuss and explain how to work with words, phrases and clauses, sentence openers and other interesting elements such as the use of questions, varied sentence lengths and so on. A Sentence Opener - is a way to begin a sentence. You need to make sure that you begin sentences in a variety of ways. Often when we get to this stage, my children find that most of their sentences begin with the subject, either by their name or by the pronoun - he, she, they. Allow them to keep a few sentences which begin with a subject, but then look for ways to alter the other sentence beginnings. Begin with : a prepositional phrase, an adverb (a ..ly.. word), an adverbial or adjectival clause or dialogue. This page shows you an example of a language arts lesson plan which concentrates on sentence openers. Review and refine your work. Have you chosen words rich with meaning? Does it create a picture in your reader's mind? Check punctuation of sentences? 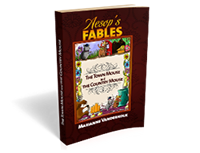 Check out my latest set of Ebooks - Aesops Fables Copywork Ebooks which contain beautiful illustrations of different fables both in colour and black and white. I have used this model when writing my 200+ page e-book, Modeling the Classics: Language Arts Lesson Plans from the Hobbit. 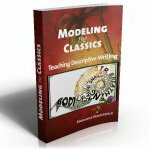 Teaching Descriptive Writing is also built around literary models and copying the style of a well know author. 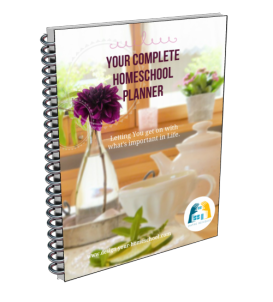 Does online homeschooling suit your family? Check out the scope of the Time4Learning Online Lesson Plans - As a member you gain access to comprehensive lesson descriptions, detailed reporting, printable worksheets and supplementary teaching guides.